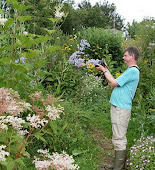 Noel's Garden Blog: The New Zealand look - the colony's revenge? The New Zealand look - the colony's revenge? o white and anglo-saxon, although the Maori gets many a respectful nod in wayside or visitor destination interpretation. Its a fascinating place to appreciate plants in a very different way to what we Northern Hemisphereans are used to, but also to consider the human impact on landscape and environmental history. The following is obviously a brief first impression. To start with, the aesthetic quality of the flora is so totally different to anything we know from the northern hemisphere, in evolutionary terms it is a very old flora derived from a tropical origin: all very graphic, and textural: tree ferns, Araliaceae, big grasses, Phormiums, and overwhelmingly evergreen and woody. Almost no perennials and almost no colour. Green, green, green - again, very tropical. No herbaceous softness. 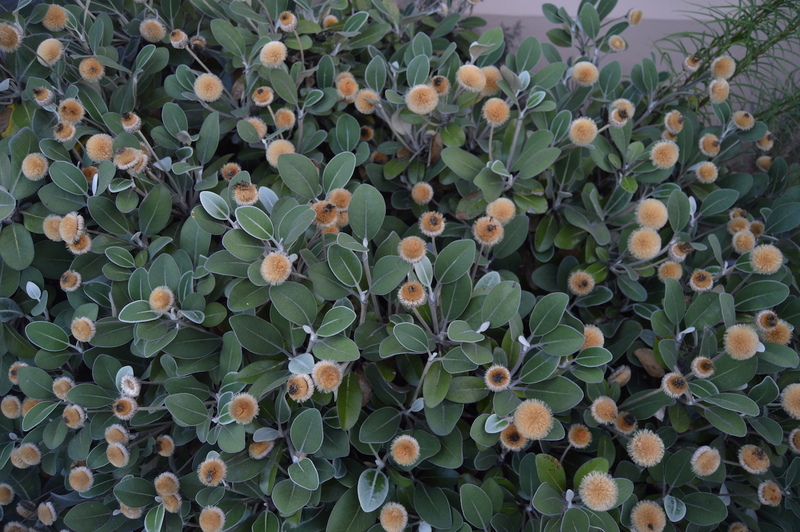 Our northern hemisphere flora must look very dull to a Kiwi, despite the colour of our flowers. It's a flora which looks amazingly neat and almost designed – at one point Jo pointed at some plants by the side of the road and exclaimed “it looks like some posh garden designer's been in and done it all”. On the wet south and west coast of the South Island it is the cryptograms (non-flowering plants) which are so amazing. This is the Land of the Fern. So many species. Big, tough muscular things, All-Blacks rugby-playing plants, not like our flimsy-mimsy ferns backhome. Coating banks, retaining walls, even replacing grass as a sunny habitat ground cover. Filmy ferns in the woods, all the way up trees. They are the ones with leaves only one cell thick, so you can see your hand through them if you hold them. Mosses, foliose liverworts and lichens of an unbelievable size. 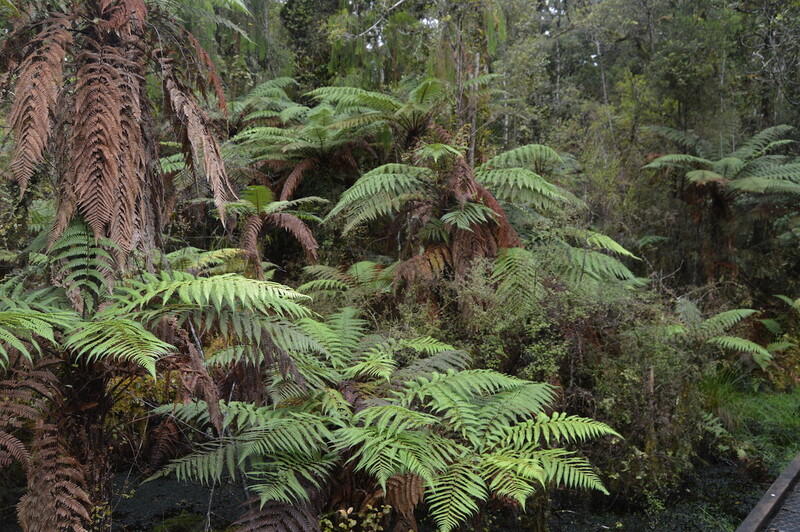 Club mosses up to a metre long dangling down banks or off trees. 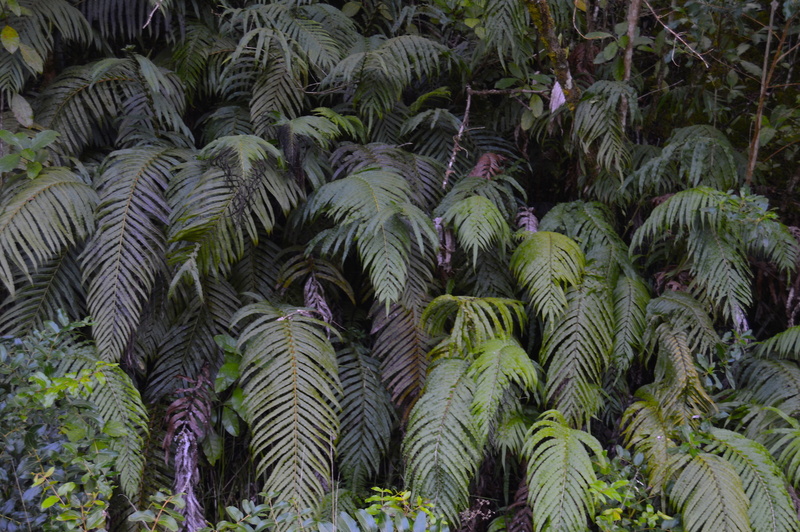 And the ultimate botanical nerdy treasure - Tmesipteris, a living fossil, with virtually no close relatives. Its like tripping: you just stand and stare at everything in a hypnotic botanical trance, the sheer level of diversity in a few cm2. is mind-blowing. Things I have never seen before, even on super-wet Yakushima (Japan) or the tropics, like weird mounds of vegetation which form over rotting timber or huge mossy lumps, a metre across, way up high in trees, or astelias or pandanus-relatives coating entire tree trunks with what looks like superisize grass. But almost no flowers, at least visibly. On our travels, admittedly in late summer, there were red metrosideros flowers and a teeny-weeny orchid and that was about it. 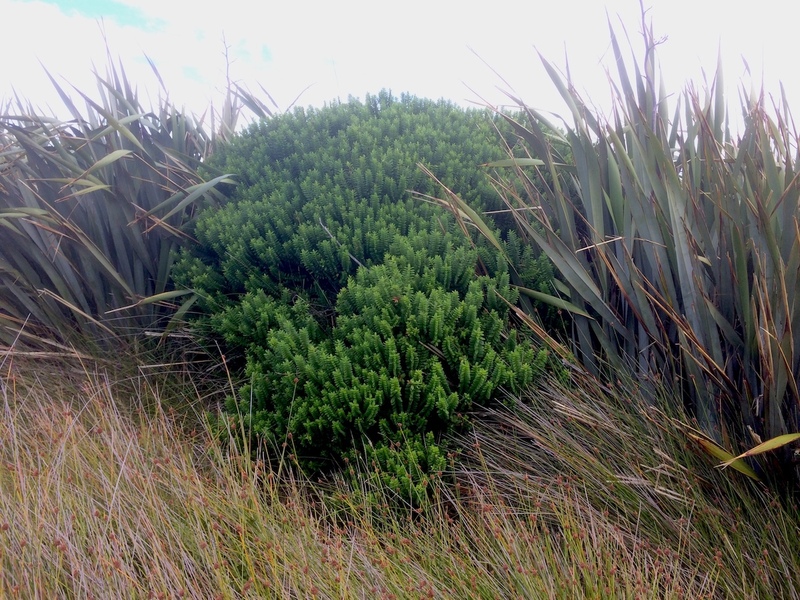 New Zealand's geological history has isolated it from the rest of the world, so plant evolution took off in a direction that was quite different to anywhere else. Its human history has been very recent, compared to the rest of the globe, and its impact on the natural world here has been sudden and drastic. Pioneers are very often rapacious in their exploitation of the novel environments they encounter, and New Zealand had the misfortune to get a double whammy within a few centuries. Polynesians arrived in around 1250, ancestors of the Maori, and as they did across the Pacific, ate their way through local bird populations, here wiping out the moas, enormous flightless birds that were the key predator of many plant species; as well as burning down much of the forest. British settlers arrived in the 19th century and proceeded to fell every tree they could get their saws into and destroy vast areas of natural habitat to make way for sheep. Adding insult to injury to the ecology they decided that the country was to be a 'new Britain', and imported a whole suite of British wildlife, including various predators like stoats and weasels, which then ate their way through much of the remaining birdlife. One of the odd things about being here is the extreme disjuncture between genuinely natural and 'created' landscapes. There are huge areas of pretty well untouched wilderness, a lot of it along the west coast, mainly terrain that must have been too steep too log. Because of the wet (we are talking metres of rain per year) this is the part of the country that is so insanely biodiverse, especially for ferns and other 'primitive' plants. Much else, especially along the east coast or the south is a very functional agricultural landscape, with almost nothing native to be seen over huge stretches. Pasture grasses (a European import), and imported tree species and that's it; the absence of anything original is quite bizarre, but then there was almost nothing in the native flora which was herbaceous and could have integrated itself into this agricultural landscape. In North America, by contrast, also a continent colonised by European pasture grasses, local wildflower species survive along roadsides in even the most ag-intensive places. There is an irony here. Just as much of New Zealand has been turned into a copy of a European landscape (albeit a very functional one) we seem to be determined to turn our designed landscapes into a copy of New Zealand. 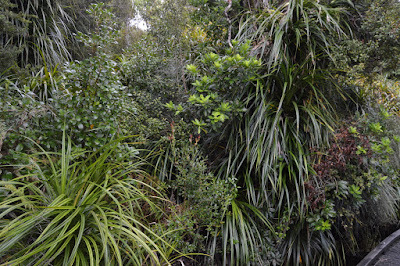 I'm not just referring to the large NZ component in our landscaping plant flora; in rough order of widespread use: hebes, phormiums, cordylines, pittosporums and brown Carex sedges, but to the fact that what we want in an urban landscape – evergreen, compact, predictable, interesting foliage, is what much NZ vegetation looks like. As climate changes and it becomes practicable to grow more NZ plant material, then I am sure this proportion will increase. British gardeners fell in love with hebes as soon as they began to arrive in the early 20th century (but they were then classified as Veronica) and the first hybrids were exported back to NZ. They are ideal for windy mild climates, like the south and west of Britain; the rest of Europe and the US, not surprisingly showed no interest in them. 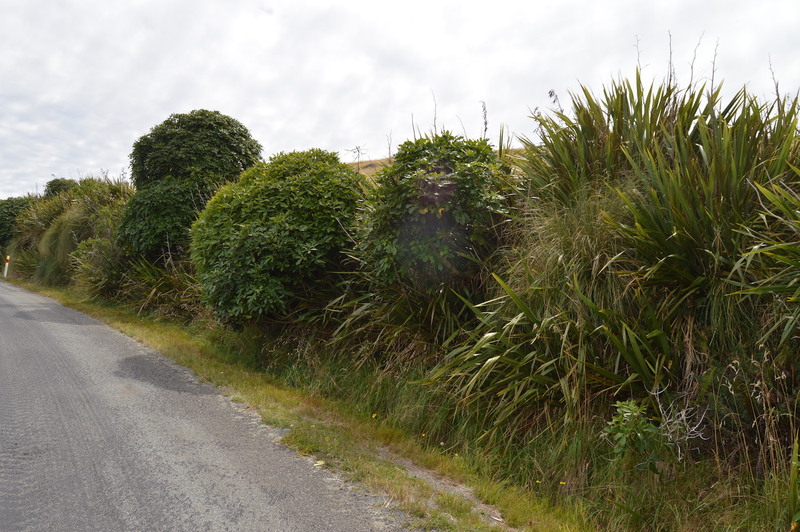 Pittosporums and various other NZ plants appeared during the same period but tended to be restricted to Cornwall and other benign climates. Then in the 1980s container loads of NZ propagated plants were imported wholesale and we had more to play with. Phormiums took off almost immediately, and I remember developing something of a dislike of them. They suddenly started appearing everywhere, often in places that were quite unsuitable, and what was once seen as a rather magnificent exotic plant seemed in danger of becoming a cliché. The same could be said of Cordyline australis in gardens, which began to make big inroads with the arrival of milder winters and the growing trend in 'exotic' and 'architectural' planting, during the 1990s. For those who could afford them, tree ferns (mostly in fact Dicksonia antarctica imports from Australia), began to sprout too in sheltered London gardens, although London is really too dry for them to be a serious long-term proposition. They look far more at home in Cornwall or west Wales where they are much more at home (and can even 'seed'). 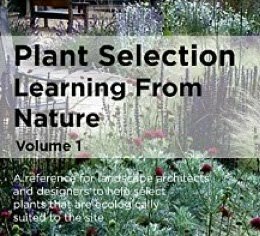 Other NZ plants began to appear at the same time, but did not make much of an impact. 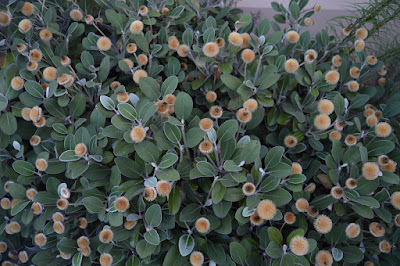 Although a lot of the flora has that chunky, graphic look, there is also a lot which, almost as a contrast, is quite the opposite: shrubs with very fine-textured foliage and very dense growth. The distinctive growth pattern of a lot of these may well have been an adaptation to reduce attractiveness to the extinct moa birds. 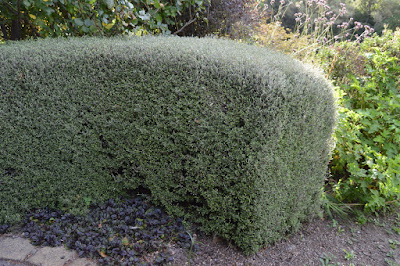 Coprosma, Pseudowintera, Corokia, all known perhaps to the (woody) plantsman, but none have made much of an impact. There being evergreen and having such neat shapes seems guaranteed to endear them to us. Looking at some of the denser coprosmas, rather a pity I think, as they look to me as if they could be the best replacement for pest and disease prone box yet. Quite the opposite of the above - a small-leaved Coprosma species makes a bril hedge - possible box substitute? What did not appear much in the 1990s and have still to make much of an impact, surprisingly, are a whole suite of Araliaceae. Like all members of the ivy family, they start off with one leaf shape and produce another at maturity. Many of us may be familiar with Pseudopanax crassifolius, and of these many of us probably rate it as the ugliest plant out; however its juvenile 'is it dead?' leaves are probably an adaptation against moas too. 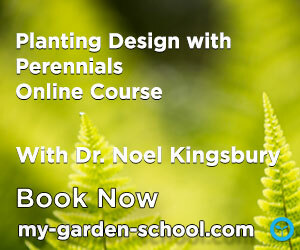 Others are more 'normal' looking and I'm surprised more have not shown up in British nurseries and gardens. For those looking to increase the distinctive foliage look in their gardens there is an awful lot to learn here and try out, whilst at the same time reflecting why it is that 'we' (Brits at any rate), having done 'our' best to turn one place into another Britain, we are now determined to make our urban landscapes as much like New Zealand as possible. at one point Jo pointed at some plants by the side of the road and exclaimed “it looks like some posh garden designer's been in and done it all”. That's a brilliant observation. I do think Australasian common areas and greens really do have the New Perennial movement beat for an uncannily sophisticated arrangement that nature actually had (something of*) a hand in. It's so interesting to read your thoughts and ideas on our country and it's vegetation. The things which we who live here take for granted, you see with fresh eyes. Like our Ferns and tough hardy forest verge or coastal plants such as Coprosma, Muhlenbeckia, Phormium (flax), Cordyline australis (Cabbage trees), Pseudopanax crassifolius (Lancewoods) and Hebes. These are the tougher and more sculptural plants which have found their way to popularity in northern hemisphere gardens. They are often the Jurassic park type plants of ancient origin, which stand out for their primitve, textural and sculptural appearance. 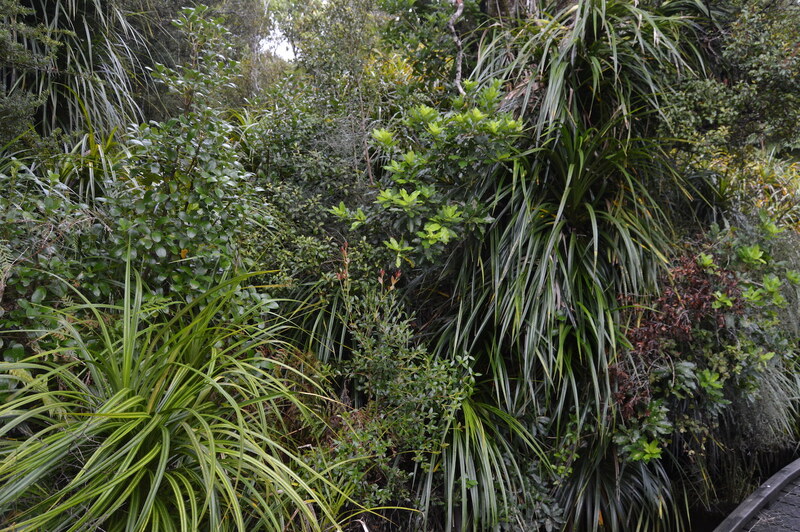 Yet these are only a fraction of New Zealand native plants. When I think of native vegetation, I think of our native forests - the huge trees of the Nothofagus forests of Fiordland close to Glenorchy where you stayed. The delicate foliage of these huge evergreen beeches through which sunlight filters so exquisitely and from which long lichens swing lightly in the breeze, is like no other forest, with it's understory of ground ferns. Also the great tracts of lowland Podocarp forest of the West Coast of the South Island with it's great Rimu, Miro, Totara and Kahikitea rising high up from the still murky waters of the swamp. This is primeval forest! Many of these pine species have juvenile forms, which are quite beautiful in infancy, like the brown lacyness of young Kahikitea. 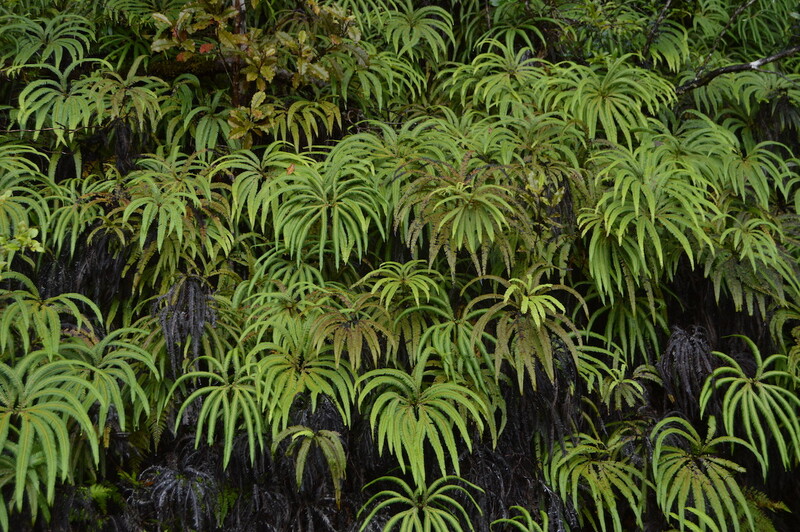 and the delicate weeping foliage of young Rimu. 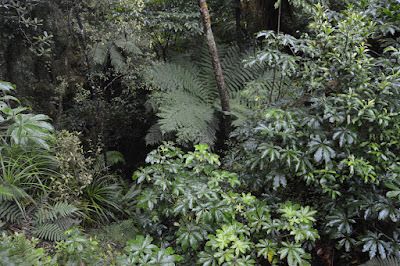 It is these juvenile forms which form the understory of this lowland forest, as well as tree and ground ferns. But alas, apart from the hardiest tree fern Dicksonia squarrosa, most of the true forest giants would not cut it in the Northern Hemisphere. They need their own rain forest micro-climates, and ecology to survive. Perhaps, Noel, you will have to come back some day to explore further. We would be delighted to see you and Jo again.